Sand Filters have been installed on tens of thousands of pools for decades- a testament to their performance, value and ease of use. But not all sand filters are equal, because not all include design features that continuously flatten and level the sand inside the tank. This is the key to consistent performance and quicker cleaning cycles that keep pump operatign costs low. 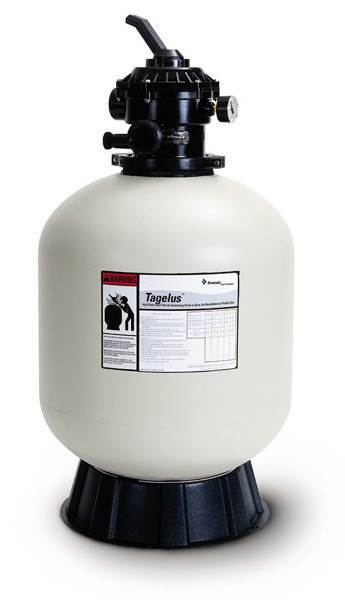 It is also a key advantagewhen you select a Tagelus Filter. Maximum water clarity with minimal attention. Tagelus filters remove particles large and small...so small that many are undetectable by the human eye, but in quantity make water cloudy. The reason thousands of Tagelus filters have been installed by pool professionals workldwide is their consistancy of performance over time. Easy does it. The six-position Hi-Flow valve has a manual air relief valve and a sight glass to make inspection, routine maintenance and operation fast, easy, and always safe. Pressure gauge also included. A special "diffuser" creates a uniform sand bed that consistently traps more dirt without impeding the water flow or letting it race through too fast--the result is more effective filtration and longer times between backwashing. Time-proven internal design ensures water is exposed to maximum surface area of sand for optimal filtration performance and more efficient backwashing. Filter diameter is 21.5 inches.